9th Sep 2016 - Its Gala Club time! The pre-harvest Gala Club meeting has become one of the most important fixtures in our'apple growing' diaries. An opportunity to discuss the prospects for the coming season with maturity and marketing criteria presented and analysed in conjunction with a 'very social event' networking with fellow growers and industry representatives. 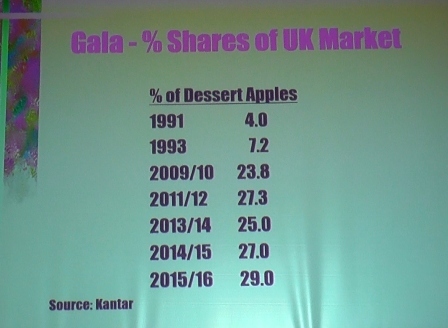 Gala has over the last 5 years become the dominant UK grown dessert apple; the variety now accounts for more than 25% of all home grown sales of dessert apples. 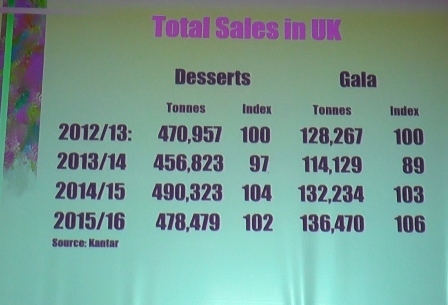 The 2015 crop sold close to 50,000 tonnes in our Supermarkets. The 2016 Gala Club pre-harvest meeting took place at Highland Court Farm at Bridge near Canterbury, by kind permission of Sean Finlayson, Farm Manager for Farmcare Ltd @ Highland Court on Wednesday 7th September. 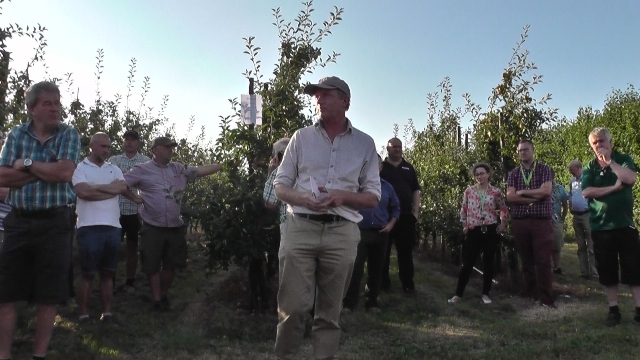 Peter Checkley and his Gala club committee set a programme for the evening focused on keeping costs down; Farmcare have invested in the latest orchard design format to maximise quality & value above chasing high yields, while employing equipment designed to reduce labour requirement. Farmcare Farm Manager Sean Finlayson has been in charge of developing the ethos since The Co-operative Farms took over Highland Court's orchards in January 2011. Highland court was originally an arable farm with a substantial Jersey milking herd. 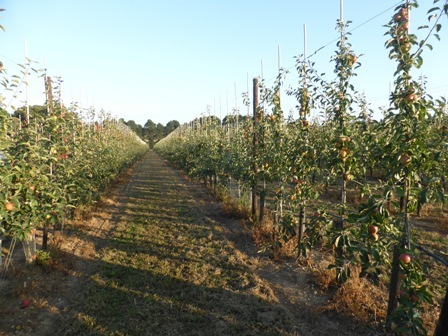 The farm started growing apples in the early 1950's and over the years increased acreage and production with new farms being acquired during the past 30 years. There is approximately 1,050 acres of farming land across the estate. From January 2011 The Co-operative Farms took on a 20 year lease of the estate's five farms, packhouse and cold stores. The Estate compromises 5 farms. 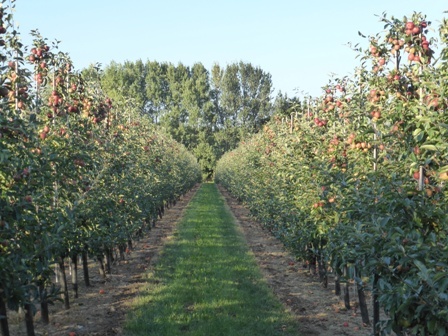 Highland Court, Paramour, Felderland, Upper Horton and Worth Hill..
A drive to replace old orchards with the latest high yielding 'hedgerow systems' has been ongoing and the target objective of uniformity at the heart of orchard management. In 2014, The Co-operative sold their farming interests to The Welcome Trust and Sean adjusted to a change in investment planning policy. A move to mixed farming is part of a 10-year plan for Farmcare, the 20,000 hectare arable business formerly owned by the Co-op. Farming business established by the Co-op in 1896. - Sold for £249m to the Wellcome Trust in 2014. - Almost 20,000 ha, about one-third of which is owned. - 15 farms, three packing facilities. - More than 200 residential properties and more than 100 commercial properties. 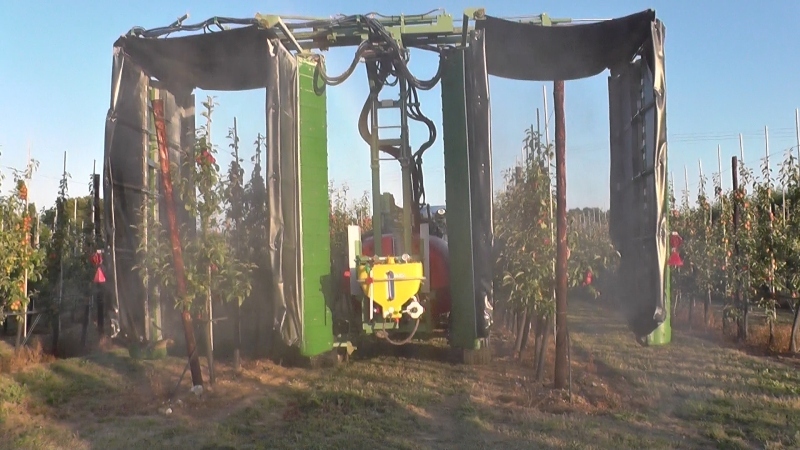 - Combinable crops, fruit, vegetables, peas, cider apples and cider production. Sean told the 50+ Gala Club members present that 'we will spend an hour walking around three specific orchards; view the apple picking rig and a demonstration of the Lipco 'two row recycling sprayer, before returning to 'The Nightyard' for refreshments and and three presentations by Dr.Martin Luton, James Simpson and Adrian Barlow. First on our tour; a 'Mariri Red'Braeburn orchard. Sean emphasised one of the guiding principles in cutting cost focuses on reducing the 'traditional 3 pick' process to a 'one pick' operation. For many years Gala has revolved around Mondial Gala which as a less highly covered Gala clone, required 2-3 picks for sufficient red colour. 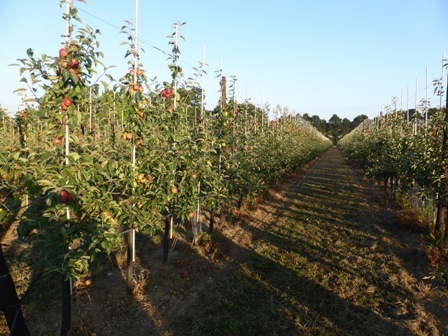 Braeburn also relied on 'bi coloured' clone - Hillwell was a popular choice, but this has also been updated with more highly coloured clones becoming the standard for new plantings. By targeting more 'naturally' highly coloured clones, it is possible (with good tree management) to operate a 'one pick policy' - Sean sees this as an essential component to keeping costs down. 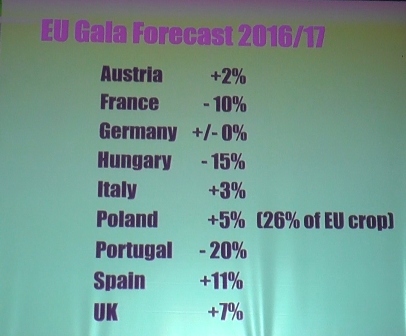 He pointed out the rise in minimum wages will have dramatic impact on the cost of harvesting; in the past a 1-3 pick scenario would see circa 60% (at best) harvested in the first pick; the second pick might account (ideally) for another 30% and the final pick would clear the trees (important) but the value of the 3rd pick unlikely to be more than juice value (below cost of production in most years. 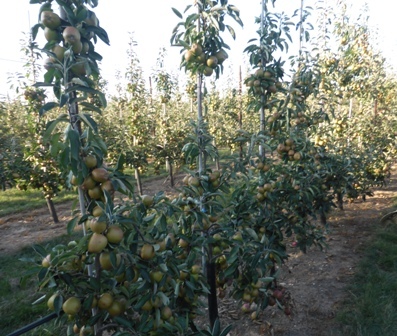 Growing 'naturally' higher coloured clones allows the crop to be harvested in 'one pick' - the fruit will also be in tip top condition for long term storage. 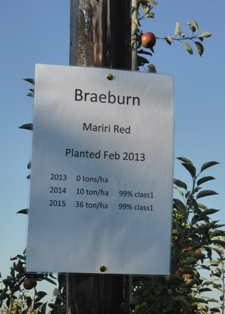 Mariri Red, which is a naturally occurring limb mutation (sport) of `Braeburn` was discovered in 1990, in the inventor's orchard in Nelson, New Zealand. 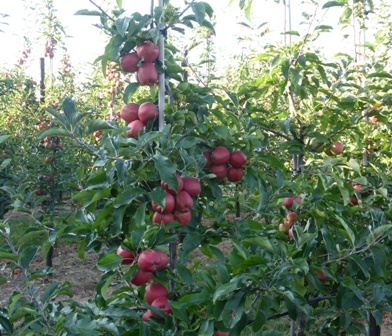 The mutation was first noticed by the inventor 2 weeks before harvest time because 2 apples on a spur had much higher red coloration than the rest of the crop on the tree. At harvest time the difference in coloration had become even more pronounced. Below: left; Gala Royal Beaut rows at Highland Court - and - right; this particular tree is ahead of the rest, but represents perfectly the Royal Beaut colour advantage. 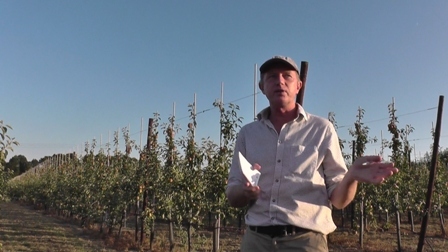 Moving on to a new orchard, Sean continued the policy for 'uniformity' - uniform tree shape, uniform yields of quality apples, and uniform systems for managing tree shape and harvest. 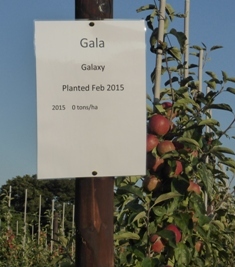 The new orchard planted in February 2015 compares Galaxy and Junami; the Galaxy were standard 'knip trees' with strong base branches designed to create a 'table' type tree, with fruit on the table and the central leader. 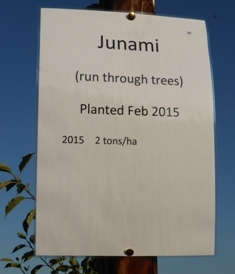 The Junami are 'Run through trees' shaped in the nursery by allowing the tree to go 'upwards' unchecked in the nursery; the optimum tree stands 2 metres high at planting with weaker (potential fruiting branches) from the lower level (knee height) to the top. Knip trees are headed off at the end of the first year in the nursery after budding/grafting and allowed to become a strong young tree with bold feathers (side shoots) ideal for trees planned to have base branches and grown as an A shape tree - Run-through trees are not headed off and allowed to continue in the second year in the nursery forming a tree of 2 metres high (ideal) with weak side shoots which will become cropping units in the orchard once planted. Sean believes this is the way forward; to create well balanced trees capable of cropping evenly all the way up the tree and capturing the maximum light, essential for good colour and fruit bud formation for the following year. Below: Junami -the variety is originally from Switzerland, and it was created from a hybrid of the Idared, Maigold and Elstar varieties. Junami apples have a fresh, fruity flavour and a crunchy bite. 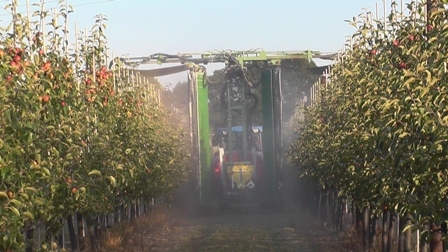 Growing the trees to maximise quality and yield is one very important component, but it does not end there; spraying the orchards to control pest a disease is vital; today many pests can be controlled with predators, but scab and mildew require regular fungicidal sprays. Harvesting is expensive and cutting costs without compromising quality, is essential. 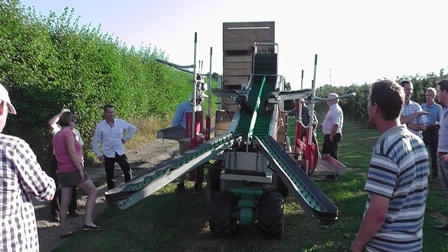 Over the last few years we have seen the introduction of 'picking trains' which speed up the picking process and 'picking platforms' allowing easy access to the tops of the trees. 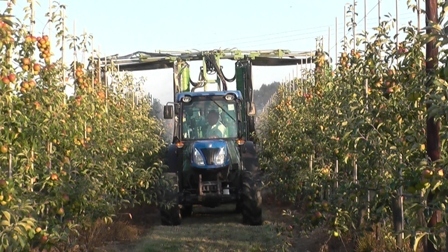 Sean has introduced a picking rig which allows the pickers to place the apples directly onto belts transferring the apples 'gently and directly' into the harvest bins. The Munckhof 'Pluk-O-Trak operates with 6 pickers on board. To see the Pluk-O-Trak operating click on to this YouTube video Munckhof Pluk-O-Trak the video runs for about 12 minutes, but by dragging the timeline to the halfway point, the viewer can see the machine operating in an orchard. The Lipco two row recycling sprayer arrived on the farm in August (it had been demonstrated at Highland Court in the Spring of 2016) and to date Sean and his team are getting to grips with the concept and measuring the potential cost saving; 'in time spent & spray saved' - a saving of 15% of chemical has been made in the 'recent' spraying operations (with full leaf cover) and Sean anticipates considerable saving in the early stages of the season when leaf is minimal. Below: left; Lipco on downward passage - and - right; Lipco moving towards the top of the orchard. 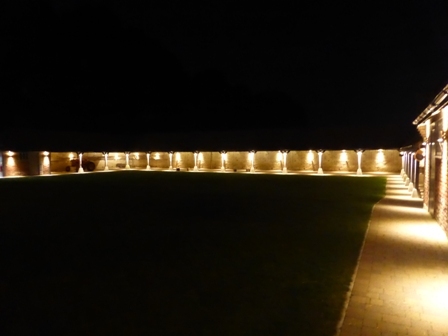 Following the tour of orchards, Gala Club members returned to The Nightyard where a welcome pint and a hog roast awaited us; sitting on a straw bale 'supping and scoffing' on perfect September evening.......brilliant! Next up; we moved into the function room for an update on maturity from Dr.Martin Luton - Fruition Technical Manager; an overview of efficient packing apples by James Simpson, MD of Adrian Scripps Ltd. and a review of the yields and sales performance of UK Apples and a preview of the prospects for the new season, by English Apples & Pears Chairman (former CEO) Adrian Barlow. Adrian retired at the end of August and a new CEO; Steve Munday has started, but Adrian is managing the information flow while Steve gains experience in the complex world of Top Fruit marketing and promotion. In past years, The Quality Fruit Group took samples from orchards on a regional basis and followed the maturity as harvest approached. This gave growers an indication of the maturity and when harvest should start for each of the main varieties; e.g. Cox, Gala & Braeburn apples and Conference pears. 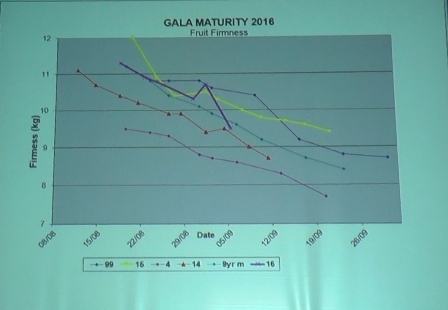 The QFG 'ceased to be' in 2014 and individual marketing groups now finance sampling and maturity assessment 'in house' - Fruition PO shared their data with the Gala Club members on Wednesday via Martin Luton. Martin had been an integral member of the QFG and in perfect position to manage the maturity assessments. During the event, Caroline Ashdown a colleague of Martin at Fruition, presented him with the David Hilton Memorial Medal (presented annually by East Kent Fruit Society) for outstanding contribution to the top fruit industry. 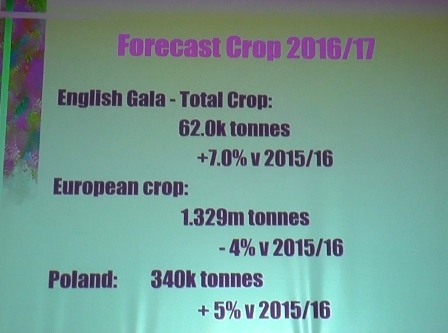 Martin had been on holiday when the annual presentations were made at the EKFS AGM and Dinner in January. "Well done Martin, thoroughly deserved"
The data presented by Martin covered; fruit firmness, starch pattern, background colour, brix (sugar) - too many to analyse in this Journal, but key elements in the decision making. Known 'minimum' standards for fruit firmness and starch levels are key elements in the timing of harvest in relation to anticipated storage period. e.g. good firmness and high levels of starch are the base standards for long term storage. 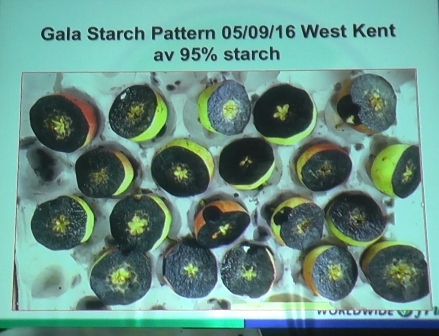 Starch rises to 100% before dropping as starch turns to sugar near harvest. 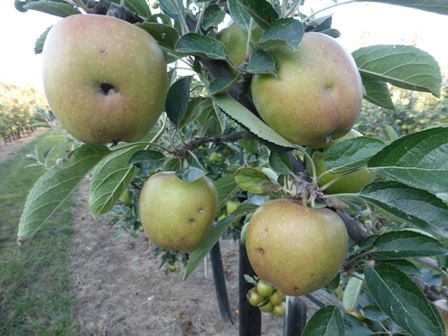 Cox apples should be above 70% starch at harvest if the fruit is to be stored to March. 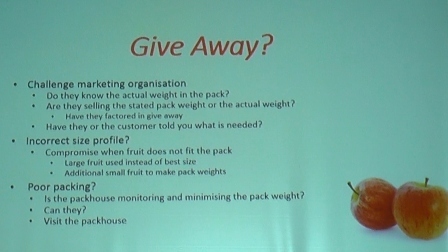 James highlighted the problem of 'give away' an important element of packing accuracy where an excess in the minimum weight in each pack (a legal requirement) has led to increasing 'overweight' in apple packs now that packs 'increasingly' marketed by Count rather than weight (but still must meet a minimum stated weight) and the size in the pack (a legal requirement of no more than 5mm span) e.g. 63mm - 68mm or 65mm - 70mm etc. 'Give away' was not so much of a problem in the past when minimum weight was the key element. But since selling by Count became fashionable, and now 'the standard' - give away is an important factor for growers and packers. James Simpson said 'give away' can easily be as much as 15% - he advises growers to be aware and negotiate, or more pointedly, ensure their marketing agency negotiates a fair price giving the consumer good value, without badly impacting on financial returns. James said he learnt this the hard way when his Braeburn apples were larger than planned one year and the larger fruit was not compensated by a higher price; the result a loss of income running into several hundred thousand pounds! 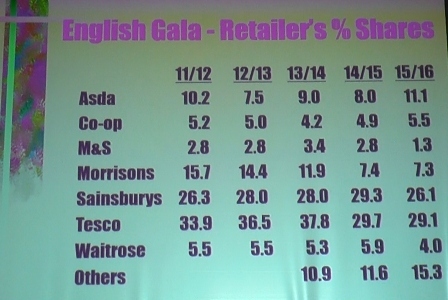 In his own inimitable style, Adrian presented a wealth of sales data; again too much to cover it all, but in the tables below a clear picture of the success of UK 'home grown' Gala and the dominant position Gala (UK and Imported) has in the marketplace. 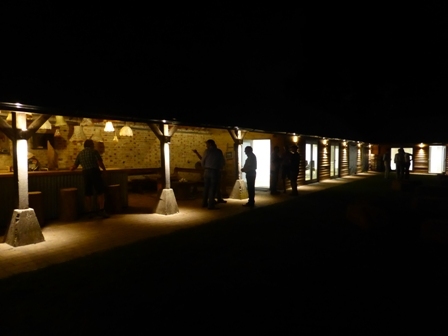 The Gala Club Pre-Harvest meeting started and ended in The Nightyard - historically where the cows on the farm were kept 'overnight' - the facility has been converted into a superb event centre hosting weddings etc. 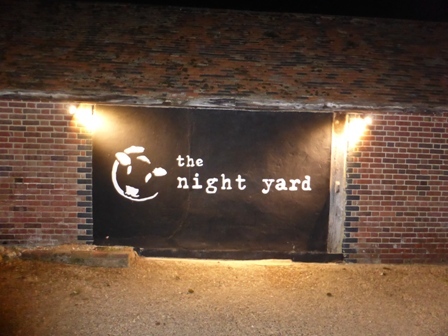 Extract from website: "A newly converted dairy herd night yard set in the heart of a working farm near Canterbury. This unique rustic venue which features a central grass courtyard is the perfect setting for your civil ceremony or reception". 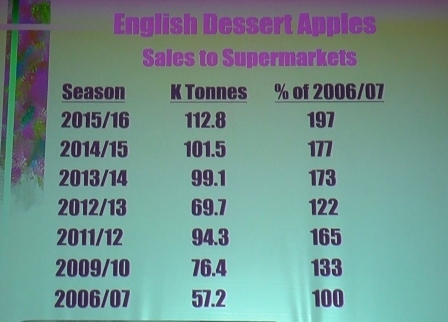 Concerns over the impact of climate change are growing in Morocco, especially among apple producers reliant on a sufficient number of chilling hours to obtain the desired quantity and quality. In addition to a drop in volume, growers have complained of inadequately ripe fruit that is smaller in size than usual, with a squishy texture, according to Medias24. Spanish and French farmers have reportedly experienced a similar phenomenon this summer. "This year, the minimum number of chilling hours was not reached," said Abderrahmane Rifa�, an expert in the development of the country's farming sector. "This is the factor that determines the number of flowering buds and therefore the number of fruits harvested. The impact on productivity has been evident." The same issues apply to other products, including peaches and nectarines, to varying degrees. Moroccan producers have therefore been compelled to invest in applied research, not into brand-new varieties, but into existing varieties currently thriving in similar conditions elsewhere in the world. 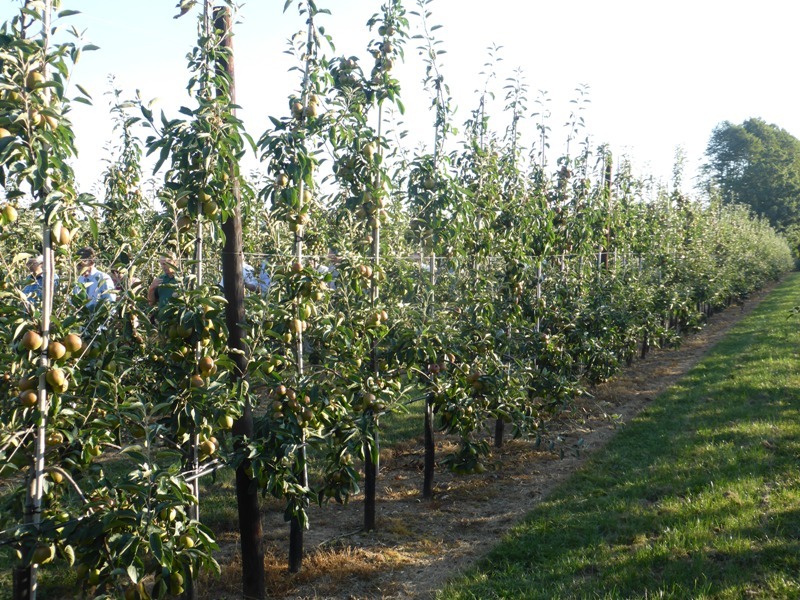 According to Rifa�, an applied research programme is being finalised as part of a partnership between the ministry of agriculture and Fedam, Morocco's federation of fruit trees. Around 30 trials will apparently be conducted in production areas across the country, with results expected in approximately ten years' time. The months of July and August were significantly hotter than average in Morocco, with many parts of the country, including Beni-Mellal, Marrakech, Fes and Ouarzazate, experiencing heat waves lasting upwards of three weeks.